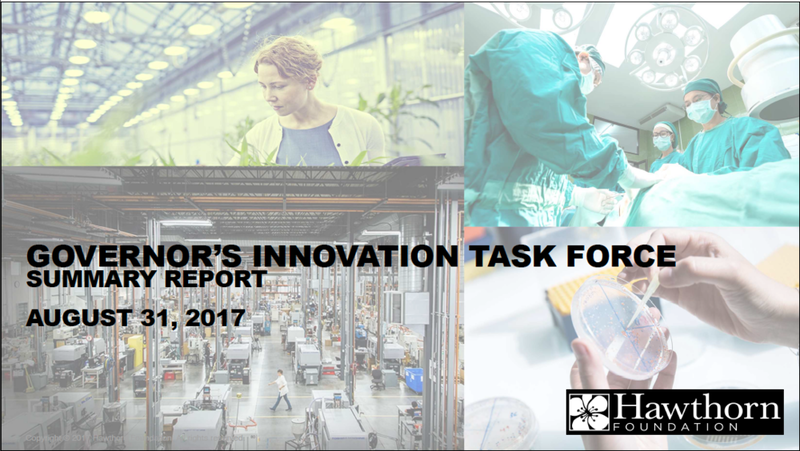 Governor Greitens established the Governor’s Innovation Task Force (GITF) on June 19, 2017 to bring together private and public sector leaders from across the State in a nonpartisan effort. He asked the GITF to (1) develop a fact-based perspective on the state of innovation and entrepreneurship in Missouri and (2) suggest options for potential state government actions to promote innovation and new technology start-ups across the state. The GITF was conducted under the auspices of the Hawthorn Foundation, as the first in a series of task force sprints to help improve the effectiveness of our government. The GITF mobilized innovators, entrepreneurs, business leaders, investors, economic developers, civic leaders, and government officials across the state to contribute to its final summary report. The GITF relied upon individuals and institutions volunteering their time and insights. Over 2000 people participated in some way during the GITF process that ran from June 19 through August 2017. The GITF completed its summary report within 75 days of launch. Members of the GITF Steering Committee presented the final summary report to the Governor on September 5, 2017 at a meeting in Cortex in St. Louis.